The card features 350 MHz RAMDAC which gives us very crisp 2D text. If you spend a lot of time in front of spreadsheets and only game occasionally that is a feature you won't want to give up. Now let's clarify that the TV-OUT feature of this card is designed to work with a standard S video cable available at any store. That easily means that you can hook it up to any video equipment designed for this connector. This is a nice feature since you don't have to have a special dongle cable to use the TV-OUT features of the card. I used the Coolbits overclocking utility with the card to see what its limits were. I was able to overclock the Leadtek card up to 245 MHz core and 385 MHz memory. I was disappointed with its lack of memory overclocking. Enter the contender. 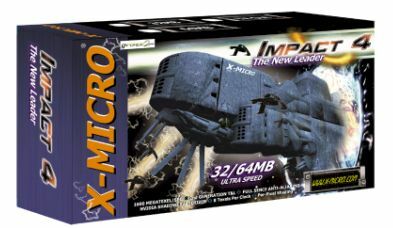 I easily overclocked X-Micro's Impact 4 to 250 MHz core and 460 MHz memory. Let's repeat that - 460 MHz memory. I got no lockups but did have small visual artifacts. I brought the memory speed down to 445 MHz and it stabilized without any visual artifacts. I think with some cooling to the memory chips in the way of heatsinks I may have been able to get 460 MHz to work without any visual artifacts. Now let's consider just how impressive this is. I got well over 100 MHz over the stock memory clock of a GeForce GTS card (333 MHz) and you have to believe that pays dividends while benchmarking and gaming. To use Coolbits make sure that you are not using the WHQL drivers. They don't allow overclocking. There are currently two versions of the 12.41 drivers available and they are identical other than the WHQL drivers lockout any overclocking.